Filmmaker Mike Flanagan, the director, co-writer, and executive producer behind Netflix's genuinely unsettling new family horror series Haunting of Hill House, is no stranger to the art of adaptation. Last year his gripping take on Stephen King's seemingly unfilmable novel Gerald's Game terrified adventurous streaming audiences and he's currently working on a big screen version of King's 2013 novel Doctor Sleep, a sequel to the author's snowbound classic The Shining. In between those high-pressure projects, he decided to tackle a seminal work by the late Shirley Jackson, possibly the only horror writer more universally beloved than King himself. With Haunting of Hill House, which just arrived on Netflix, does Flanagan do justice to the spooky spirit of Jackson's 1959 book of the same name? At 10 episodes, including a few that (unsurprisingly for Netflix) stretch beyond the one-hour mark, the TV version of Hill House is certainly longer than the novel, which doesn't crack 300 pages and can be read in a few sittings. Obviously, girth doesn't always translate to quality -- and Flanagan has taken some significant liberties with the text, using the novel as an inspiration rather than a roadmap -- but Jackson fans should find dark pleasures in the ways the series interprets elements of the story, reconfigures certain characters, and drops sly references to the original. As one would expect from a story like this getting the prestige TV treatment, the series has a clear reverence for Jackson's work. 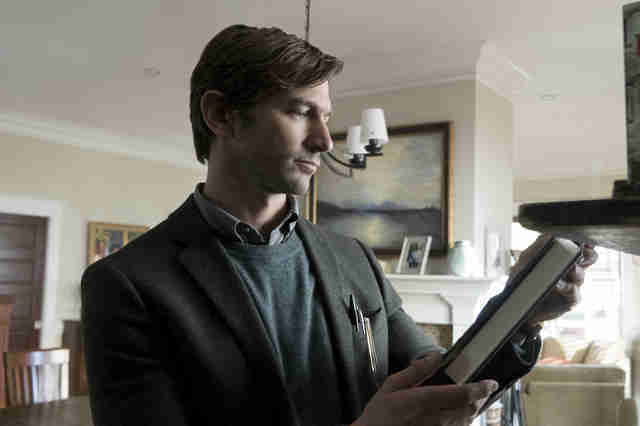 (At one point, we see Steven, the Crain child played by Michiel Huisman, reading a copy of Jackson's short story "The Lottery," a high school English class staple.) Despite totally reimagining the story -- Hollywood did something similar with both the 1963 and 1999 movies The Haunting -- Flanagan retains the thematic core of the novel in some effective ways that we've highlighted below. The scary house is still at the center of the story. The version of the Crain family the series is built around is an invention of Flanagan's, but the names should strike book-readers as familiar. In the novel, Hugh Crain is the original builder of Hill House; here, he's played by Henry Thomas (yes, Elliott from E.T.) in the "past" sections and Timothy Hutton (Ordinary People) in the "present" sections. (The series moves back and forth between the past and the present like a spine-tingling This Is Us.) 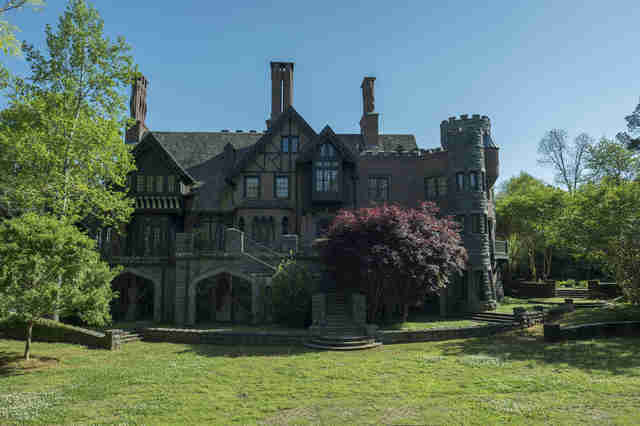 In Flanagan's version, Hugh arrives at the already built Hill House with plans to flip it with his wife Olivia (Gerald's Game star Carla Gugino) and their five adorable children as part of an ambitious summer renovation project. This being a horror show, things don't go as planned. It gives some of Jackson's prose to its writer main character. Whole paragraphs of Jackson's evocative writing get read in voice-over in the series, but in the world of the show, the punchy and carefully crafted sentences are most often attributed to the protagonist Steven Crain, who is played by Game of Thrones' Michiel Huisman in the "present." Unlike Jackson herself, he's not a novelist -- or, at least, he's not a successful one. Instead, he's carved out a career by turning his traumatic experiences as a child at Hill House into a series of slightly pulpy-looking non-fiction books about "real" examples of the supernatural. Basically, he's like a more skeptical and literary version of the guy from the TV show Ghost Adventures; in the first episode, he spends a night at a different haunted house in an effort to debunk it. Unlike some of his siblings, Steven Crain is not named after a character in the novel, but he is modeled after one of them: Dr. John Montague, a paranormal expert hoping to find evidence of the supernatural during a summer's stay at Hill House. 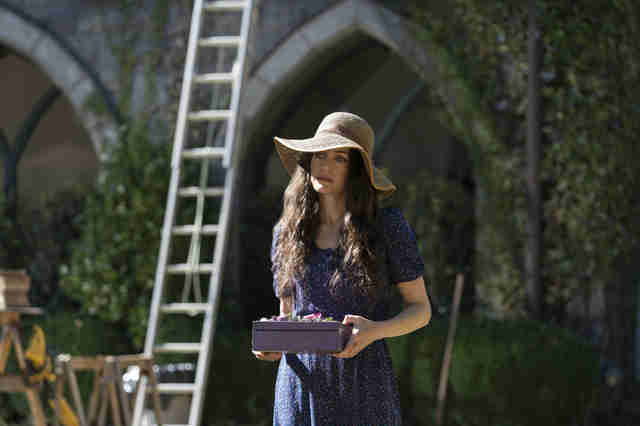 As for the other family members, the drug addicted Luke (Oliver Jackson-Cohen), the mentally telepathic Theodra (Kate Siegel), and the baby of the family Eleanor (Victoria Pedretti) are drawn from Jackson's creations, Steven and his funeral-home director sister Shirley (Elizabeth Reaser) are not. (You get one guess where they got the name Shirley.) A "Dr. Montague" also shows up in episode 5 as Eleanor's therapist. Like the book, the series is all about mind games. 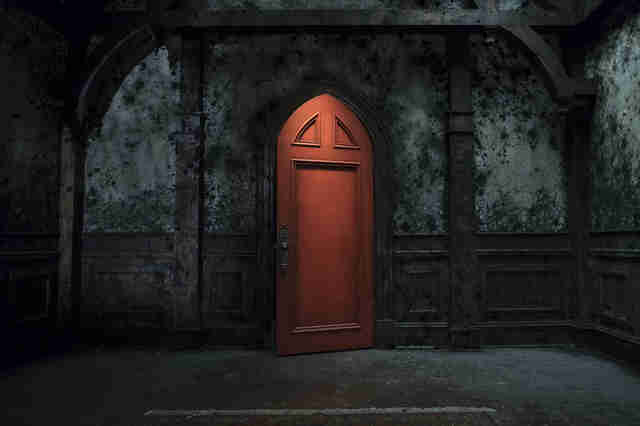 In between the occasional startling jump-scares and gruesome imagery, Haunting of Hill House series is mostly concerned with mental health, particularly the ways families can pass trauma between generations and inflict pain on one another across time. Yes, heavy stuff. But Jackson's book didn't become a horror classic by shocking readers with buckets of blood or masked killers. Instead, the novel makes you question whether certain events are going on in reality or in a character's head. The ambiguity adds to the terror. Olivia's struggles in the flashback section of the show are some of the show's most potent attempts to examine similar ideas. She suffers from headaches, which can strike at any moment and intensify as the family stays at the house. Soon, her grip on what's real slips. Similarly, the stand-out fifth episode of the show, "The Bent-Neck Lady," which tells the heartbreaking story of Eleanor's mysterious suicide, features a handful of scenes of sleep paralysis that could very well make you scared of going to bed at night. Look for details, like the "cup of stars." 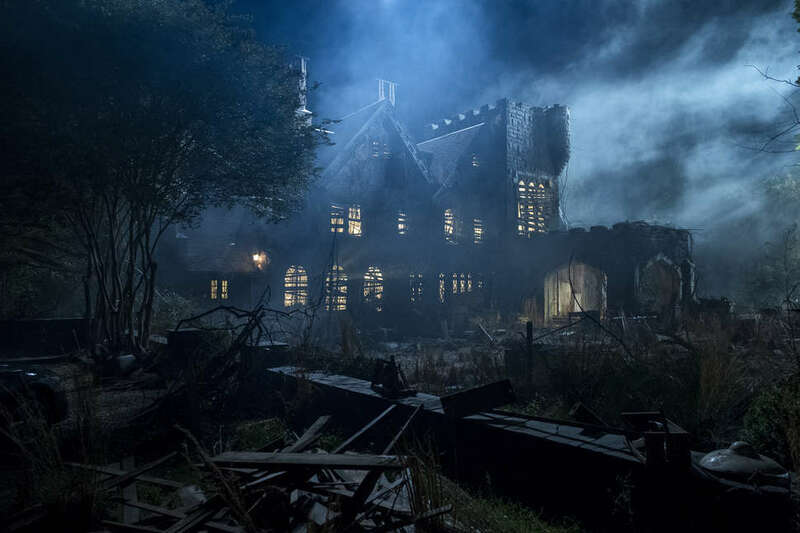 The "grab what you want" freewheeling approach Flanagan takes on Haunting of Hill House will likely leave some Jackson obsessives frustrated. As with any high-profile adaptation of a classic text, there's always going to be viewers who feel like the new writers "missed" the spirit of the original. But if you have read the book and you eventually fall under the show's slow-burn spell -- seriously, I would recommend skeptics at least stick around to the truly stunning sixth episode, "Two Storms" -- there are fun little turns of phrases (or supporting characters, like the caretaker couple the Dudley's) that will send you racing back to your bookshelf to thumb through your old paperback. Specific props and lines of dialogue can trigger memories. For example, the lines about a "cup of stars" during a pivotal tea party sequence in the show reminded me of a passage from the book where Jackson writes of how Eleanor insists a little girl drinks from that particular cup because "once they have trapped you into being like everyone else you will never see your cup of stars again." In the moment, Jackson is writing about non-conformity and individuality. That larger message, more than a single plot element, appears to be the idea that Flanagan took to heart when crafting his tribute to the author.